Start setting empowering intentions. 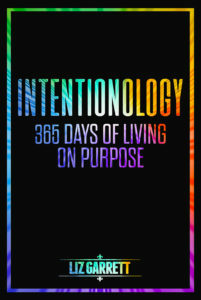 Get “Intentionology” on Amazon now! Science says you can program your brain. Actually, you already have. The question is, how’s that working for you? Experience more of what you long for! Part science, part magic, the simple practice of consciously determining the outcomes you desire sets powerful forces into motion on your behalf. Your life becomes a co-creative dance of manifestation. Every experience is a feed-back loop of learning. Program your brain to work on autopilot FOR–not against–you. This practical guide helps you develop a daily practice that replaces negative thought patterns with empowering, uplifting ones. A few minutes a day can change everything–forever–and it’s FREE, easy, and life-changing. “Intentionology” serves you in many ways. Create a regular habit, or dip in and out as needed, or just enjoy beautiful inspiration when you need it. Read for a quick shift. You will develop a beautiful, meaningful, ever-evolving guide that will support you the rest of your life. 365 intentions for you to rewrite and reword, making them your own. Reinforce positive intentions 80 times a day! * Display these inspirational images on all your digital devices and, with every glance, you’ll form and strengthen neural networks that support greater health, wealth and happiness. Effortlessly. Painlessly. Effectively. Make your mind work for–not against–you.